The paperback edition of a milestone work that has been unavailable for several years, documenting the short but influential life of Black Mountain College. 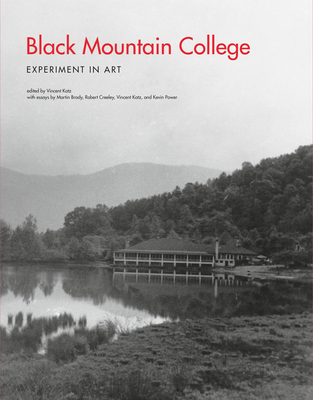 Although it lasted only twenty-three years (1933-1956) and enrolled fewer than 1,200 students, Black Mountain College was one of the most fabled experimental institutions in art education and practice. Faculty members included Anni Albers, Josef Albers, Ilya Bolotowsky, John Cage, Harry Callahan, Merce Cunningham, Buckminster Fuller, Walter Gropius, Clement Greenberg, Lou Harrison, Franz Kline, Willem de Kooning, Jacob Lawrence, Robert Motherwell, Roger Sessions, Ben Shahn, Aaron Siskind, Esteban Vicente, and Stefan Wolpe. Among their students were Ruth Asawa, John Chamberlain, Ray Johnson, Kenneth Noland, Robert Rauschenberg, Dorothea Rockburne, Cy Twombly, and Susan Weil. Literature teachers included Robert Creeley, Robert Duncan, Charles Olson, and M.C. Richards, with students Fielding Dawson, Ed Dorn, Francine du Plessix Gray, Joel Oppenheimer, Arthur Penn, John Wieners, and Jonathan Williams. This book--the paperback edition of a milestone work that has been unavailable for several years--documents the short but influential life of Black Mountain College. Nearly 500 images, many in color and published for the first time in this book, show important works of art created by Black Mountain College faculty and students as well as snapshots of campus life. Four essays, all commissioned for the book, offer closer looks at the world of Black Mountain. Poet Robert Creeley recounts his first meeting with his mentor and friend Charles Olson. Composer Martin Brody offers a history of the musical world of the 1930s to 1950s, in which Black Mountain played a significant role. Critic Kevin Power looks at the experimental literary journal The Black Mountain Review, which was instrumental in launching the Black Mountain school of poetry. The book's editor, Vincent Katz, discusses the philosophy of the college's founders, the Bauhaus principles followed by art instructor Josef Albers, and the many interactions among the arts in the college's later years. Vincent Katz is a poet, translator, and curator based in New York City.